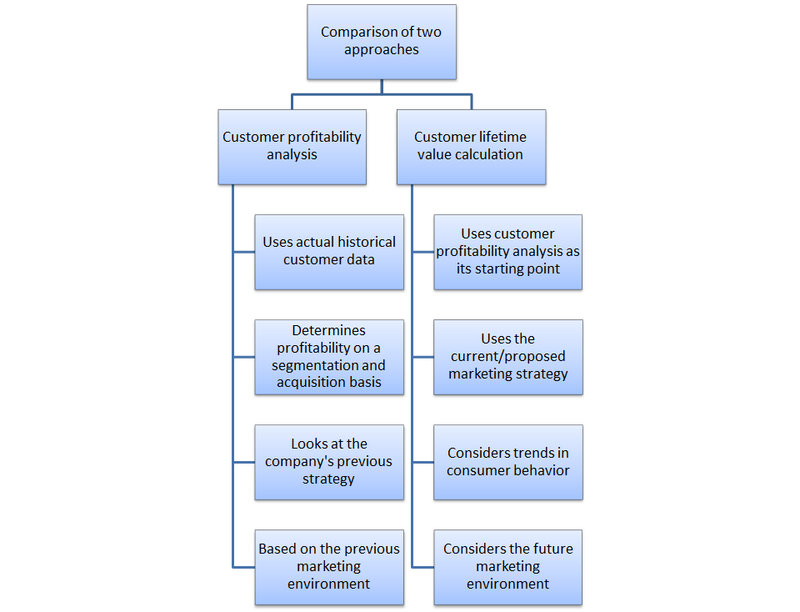 What’s the difference between customer profitability analysis and customer lifetime value? Before we start discussing the inputs to the customer lifetime value formula, it is probably worthwhile to clarify the distinction between customer profitability analysis and customer lifetime value calculation. These two sets of terms are quite similar and may often be somewhat confused. It is likely that most marketers conduct customer profitability analysis from time to time, even perhaps on a regular basis. In this process, a marketer with look at the historical data – most likely from a customer database – and try to determine the level of profitability of each customer or each segment of customer. It is similar to the customer lifetime value calculation in that customer profitability should also include customer revenues and customer costs over time to determine the profit contribution of the customer. Also similar to the customer lifetime value calculation, customer profitability also take into account initial acquisition costs in order to derive a “net” profit contribution. As part of this analysis, the marketer will look to see if there are any differences in consumer behavior depending upon the method of acquisition, any segment profile information, and different marketing approaches over time designed to gain greater share-of-customer or to enhanced loyalty. In other words, in addition to simply looking at customer profitability (usually on a segment basis), the marketer should consider the impact of various marketing strategy. For example, does a first-time customer who was attracted by TV advertising more loyal have a high retention rate than a first-time customer attracted by a sales promotion discount? By answering these types of questions, the overall effectiveness and marketing ROI of various marketing strategies and campaigns can be evaluated. In addition to looking at customer profitability in conjunction with acquisition costs, the marketer should also look at customer profitability in conjunction with special offers and incentives provided to the consumer to purchase more products or remain loyal. Again, this type of analysis will demonstrate the effectiveness of marketing from an ROI perspective. All of these forms of analysis can also be scenario tested using the customer lifetime value formula – so what exactly is the difference between customer profitability analysis and CLV? 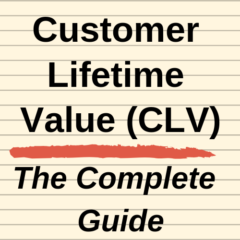 Customer lifetime value (CLV) is a forward looking tool – it is a forecast of customer profitability. The marketer will build in various assumptions regarding future revenues, costs and retention into the model to construct a view of customer lifetime value across different customer segments. The obvious question is why would a marketer run forecasts given have they have real historical data where they can calculate customer profitability precisely? The answer to that question is that marketing is dynamic. It is dynamic because the marketplace changes, consumer preferences changes, new technologies emerge, customer lifestyles change over time, and so on. In addition to all these external environmental changes, it is hoped that the marketing department is conducting marketing experiments and developing greater insight and understanding of how to create responsive customers and to increase conversion rates. Therefore, in most industries, it would be generally inappropriate to rely upon historical data only. No doubt historical data is a critical input to compare the data and assumptions to calculate the customer lifetime value. Basically the intention is to utilize the prior customer profitability analysis and modified according to the dynamic marketing environment and to the firm’s proposed marketing programs. To make a very simple distinction between customer profitability and customer lifetime value – customer profitability looks at the past (and the previous marketing environment and the previous marketing programs of the firm), whereas customer lifetime value looks at the future marketplace in conjunction with the proposed marketing programs of the firm.